Did you enjoy your extra hour this past weekend? For most of our members, though not all, this past weekend was the FALL BACK weekend when we all go to bed at midnight but set our clocks to say 11:00! Who says there are only 24 hours in a day? But Special Education administrators have always been able to squeeze more hours out of a day than most folks can, right! But if you live in Arizona, you never have to set your time back — though you do alternate between Mountain time to Pacific time! One of the hardest things for me to get used to when I first took the job of CASE Executive Director 12 years ago was planning around different time zones! We have members around the globe but the vast majority of our members are in the U.S. and Canada. But even just considering those members involves 7 time zones! We do try to be considerate of those especially as we plan our Hybrid conference! We haven't had a virtual site in Hawaii yet but we always have several in Alaska! And speaking of Canada ... We are so excited that both of the CASE Canadian units, British Columbia and Ontario, will be represented at our fall Board of Directors meeting, Nov. 12-13, in San Antonio! So far 36 of our 40 subdivisions will be at the BOD meeting. This representation is critical for CASE to truly be your voice! Make sure your voice is heard by contacting your subdivision president and letting them know what is important to you! One of the things we will be giving out at the BOD meeting this year is our CASE Biennial report. All members will be able to download the report after Nov. 17 behind our Members Only section. If you go there now, you can download a copy of the 2010-2012 and the 2008-2010 reports. Or is you would like a hard copy, you can contact the CASE office to purchase one for $5. Speaking of the BOD meeting ... The Governmental Accounting Office has asked CASE to assist them with gathering information for Congressional leaders on the additional paperwork and administrative regulations from IDEA. We are thrilled there will be three (3) representatives from GAO to work with our Board of Directors (Nov. 12-13) and to hold 3 focus groups at our 25th Annual fall conference in San Antonio on Nov. 13-15. Still haven't registered for the 25th Annual CASE Fall Conference? Well, there is still time! We have an overflow hotel, The Emily Morgan (a Hilton property), honoring our $139 rate but those rooms are going fast too! There are over 42 different states and provinces registered for the conference — what a great opportunity to network with your colleagues. Professional Development Chair Will Gordillo has put together an amazing program for our CASE members for the 25th Annual CASE fall conference! Our three keynotes will definitely inspire you but they also will provide you with a wealth of practical tools you can use in your everyday work ASAP. Drs. Stevan Kukic, Randy Sprick, and Frances Stetson will totally blow you away with the quality of their presentations! I have heard each of these 3 professionals on many occasions and I have always left with new ideas, new tools and a feeling that the job I do is important and necessary! The 30+ breakout sessions are also full of practical, evidenced based information. Click here for a list of the breakout sessions. If you want to learn what's new, connect with your colleagues from around the U.S. and Canada, and experience some quality professional learning that is both inspirational and content laden, then join us in San Antonio Nov. 13-15! Registration is up at www.casecec.org. What a difference a year makes! Last week's poll was about what your biggest problems are right now. For the last couple of years, finance/budget was the number one problem. 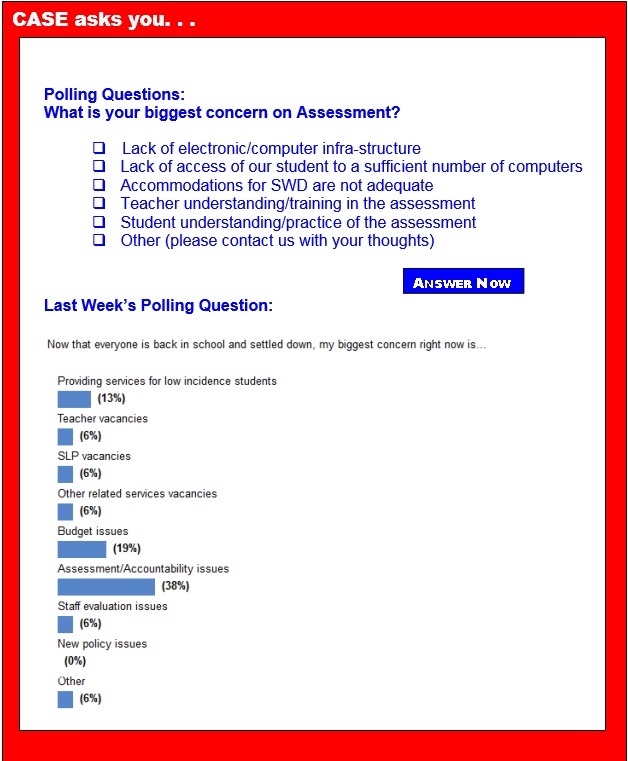 For those who answered the poll this last week, the number one problem was Assessment and Accountability at 38 percent. Budget came in second with 19 percent. Third highest at 13 percent was providing services for low incidence students. There was a four way tie for the next highest, all at 6 percent — Teacher vacancies, SLP vacancies, Other related services vacancies, Staff evaluation and Other. Be sure you answer this week's poll. It is helpful to the CASE committee chairs to see the answers. We are always looking for great polling questions, so if you have one, send it our way! On October 27, 2014, U.S. Secretary of Education Arne Duncan and Health and Human Services Secretary Sylvia M. Burwell announced that 35 states and Puerto Rico have applied for grants under the new $250 million Preschool Development Grants program. By significantly expanding their preschool programs, over 25 high-need communities in approximately 12-15 states will benefit from Preschool Development Grants funding so that a large portion of their at risk 4-year-olds start school prepared. States will agree to uphold standards for high-quality preschool programs in the communities that are funded. This fall, over 450 early learning professionals from around the country gathered in New Orleans, Louisiana to attend the Improving Data, Improving Outcomes conference. This conference, hosted by The Center for IDEA Early Childhood Data Systems along with the IDEA Data Center, and the Early Childhood Technical Assistance Center, focused on issues related to Part C and Section 619 programs such as coordinated early childhood data systems; measurement and use of child and family outcomes data; and resources for improving systems of services. Nonprofit groups specializing in children's learning and attention issues will introduce a new website and a public service advertising campaign that was created with the Advertising Council. The website, Understood.org, is intended to help parents better understand these issues and provide advice on dealing with them. According to the 2014 State of Learning Disabilities Report from the National Center for Learning Disabilities, one in five people in the United States age 3 to 20 has problems with reading, math, writing, focus and attention. Maker education is a new school of educational thought which strives to deliver constructivist, project-based learning curriculum and instructional units. Makerspaces can be full high school workshops with a bevy of high-tech tools, or as small and low tech as one corner of an elementary classroom. What defines a makerspace isn't just the tools and equipment, but the learning that happens as students begin making and creating projects. Educators need to design these spaces to reach a diverse set of learners, particularly populations underserved in STEM subjects, and students with neurological differences, learning differences and special needs. New research reveals that high school students with attention-deficit/hyperactivity disorder are using an unexpectedly high rate of services for their age group, yet many low achievers with ADHD are not getting the academic supports they need. Scientists from UNC's Frank Porter Graham Child Development Institute and several other universities published the findings in School Mental Health after examining data for a large national sample of high school students with ADHD. School districts from New Hampshire to Oregon are revolting against the coming Common Core tests. Even as political leaders in both red and blue states continue to back away from the standards — New York Gov. Andrew Cuomo is the latest example — the hottest battles have shifted to the local level, where education officials are staging public revolts against state and federal mandates to administer Common Core exams. While more students are graduating from high school and college, the number of young students enrolled in preschool in recent years has stagnated. A new index from the nonprofit groups Opportunity Nation and Measure of America looks at the level of opportunity afforded to citizens around the country in the areas of education, jobs and local economy, community health and civic life. The index ranks the best areas for educational opportunity, based on on-time high school graduation rates, the percentage of adults with an associate's degree or higher — and on preschool enrollment rates. And while the report found that levels of opportunity in America have improved overall since 2011, that accomplishment has not been the case for getting kids enrolled in preschool. President Barack Obama appears to be behind his administration's recent rhetorical push on the need to reconsider the number of tests students take, sources say. And the president's new thinking on tests would seem to put U.S. Secretary of Education Arne Duncan in a pretty awkward position. For the first six years of his term in office, Duncan has bet big on student scores on state tests, pressing states to use them in pivotal decisions, such as teacher evaluations. For most of the 40-plus years the term "dyslexia" has been in existence — and although the diagnosis has long been considered a "learning disability" — it has been based on comparisons with average readers. Simply put, a child could be diagnosed with dyslexia if he or she shows an IQ in the "normal" range but falls at or below the 10th percentile on standardized reading tests. This cut-off has been arbitrary, often varying from district to district and based on Response to Intervention criteria. As a result, a child who falls at the 12th percentile might be considered a poor reader while a child at the 10th percentile would be diagnosed with dyslexia. Holidays vs. standards: Which curriculum rules your school? I remember that in elementary schools 30 years ago, the year was chronologically marked by holidays. We started with a summer story, then a scarecrow or scary story, followed by a turkey story and ending the year with something about a snowman. The new year would offer a change of pace with nonfiction text, then it was back to narratives: Valentine's Day, St. Patrick's Day and Easter bunnies. But in the age of Common Core and far more rigorous standards, are we still allowing the hidden curriculum of holidays and seasons to run the show? The rise of the standing desk may appear to be a response to the modern, eat-at-your-desk, hunched-over worker chained to her computer, but history paints a different picture: Hemingway, Benjamin Franklin, and Thomas Jefferson all stood while they worked. Donald Rumsfeld had a standing desk, and so did Charles Dickens. Workplaces are moving toward more standing desks, but schools have been slower to catch on for a variety of reasons, including cost, convenience, and perhaps the assumption that "sit down and pay attention" is the best way to learn.